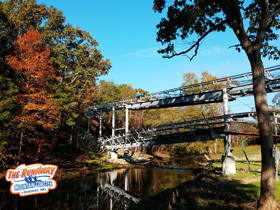 The” Runaway Mountain Coaster” uses the natural topography of the Ozarks to have an exciting user-controlled thrill ride that your family will want to ride again & again. Riders are seated in individual carts that are pulled to the top via a chain similar to traditional roller coasters. At the top of the mountain, carts are released to travel down the hill, winding in and out and around trees and hills for a thrilling and unique experience. These low profile mountain coasters are specially designed to be as unobtrusive as possible and preserve the natural beauty of the area while providing an experience few will ever forget. At “Runaway Mountain Coaster,” using a patented braking system, you can choose whether to slow down and take a more leisurely trip down the coaster track or use gravity to the full extent for the fastest and most exciting ride possible. That means that whether you are a roller coaster thrill seeker or someone looking for a pleasant trip down the hill and an unparalleled view of the Branson skyline, you’ll have a great time. A lone driver must be at least 9 years old and 52″ tall. A passenger must be at least 3 years old and 36″ tall. To ride double, the driver must be at least 16 years old. The maximum combined weight of the riders is 300 pounds.